Another U.S. is Possible - Another Political Party is Necessary! The Green Party's Jill Stein embellished her reputation as the first "Occupy Wall Street candidate" on the American political scene in the days leading up to the Jan. 20 Occupy the Courts demos, as she carried her presidential aspirations to protest gatherings in the D.C. area. "My hope is to leverage and support and promote the incredible inspiration and power that we're seeing here in this field today," the Lexington, Mass., physician said on Jan. 17 at the Occupy Congress event across from Capitol Hill. "The effort to occupy Congress I think is all about occupying our economy, about taking it back, taking back our democracy, and that includes occupying our elections." Three days later Stein stood on the steps of the Supreme Court, a lead speaker at the most prominent of more than 100 Occupy the Courts rallies at federal court buildings nationwide demanding repeal of the court's Citizens United ruling, which subjects the electoral system to unlimited, anonymous, financial contributions from the 1%. "Since 1996, the Green Party has called for a constitutional amendment to abolish the doctrine of corporate personhood," she said. "Greens have been ahead of the curve, but today, the curve has caught up with us, and now this movement for a constitution that serves we, the people, has gathered a historic momentum." The Supreme Court granted corporations personhood – the same rights as human beings – in 1886. Citizens United expanded that doctrine by equating campaign spending with free speech and said it cannot be abridged, overturning part of the 2002 McCain-Feingold campaign-finance reform law. Stein is one of two declared candidates for the Green Party nomination, which will be decided at its convention in Baltimore in July. San Diego air quality inspector Kent Mesplay is the other candidate. From the beginning, Stein has proudly trumpeted what Chris Kitto, a columnist for The Hill, called the seamlessness between her campaign and the Occupy Wall Street movement. Barely a month after declaring her candidacy in October 2011, Kitto penned a column titled "Occupy the White House" in which he asked if Stein was indeed the first Occupy candidate. During her Jan. 17 stop at Occupy Congress, Stein was interviewed by the nonprofit, online news site NationofChange. Americans are in crisis, she said. They are losing their jobs, homes, health care, pensions, educational opportunities and civil liberties. "We are in crisis," she said. "And the top 1 percent is rolling in dough more than ever. And our elected officials who got us into this mess, the establishment political parties, are not only not fixing it, they are making it worse, by imposing austerity on the people of America." At the same time, Democrats and Republicans throw trillions of dollars into wars, Wall Street and tax breaks for the wealthy, who don't even need it, she added. "This is really our opportunity to take back the promise of democracy and start building the peaceful, just, secure, green future that actually is within our reach right now," she said. The News Journal in Wilmington posted a story on Stein's Jan. 19 visit to the Spencer Plaza, where Occupy Delaware has been encamped since November. The report mentioned her “Green New Deal,” which focuses on ending unemployment by investing in green jobs, stopping climate change, treating health care as a human right and ending the oil wars. Stein told the protesters that she shares the Occupy movement's frustrations with President Barak Obama and that both major parties are doomed. A WDEL-AM story quoted Stein calling the Democratic and Republican parties sinking ships. "You can argue which one is going down faster, but they're both taking us down," she said. "Our economy, affordable education system it's all going down." 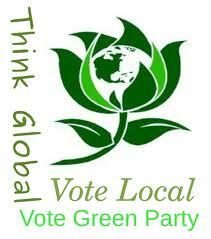 The Green Party, she said, will be on the ballot in 45 states and is the nation's only viable alternative party. The D.C.-area trip was Stein's first to the Mid-Atlantic and also included a stop at Occupy Delaware in Dover and fundraisers in Arlington, Va., Dover, Baltimore and Washington. 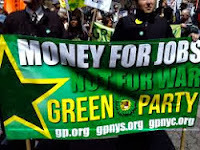 In her blog post on Occupy the Courts, Stein noted that the Green Party has direct ties to the event. It was sponsored by the nonprofit group Move to Amend, whose chief organizers include 2004 Green Party presidential candidate, David Cobb. Cobb was among those quoted in a Jan. 20 article in The Guardian about the day's events. "The Supreme Court has hijacked our democracy from us and used the court to legalize the theft," Cobb told the British paper. "Corporate contributions to elections are not just contributions they are investments. They are literally buying and selling legislation." Flush The TPP! Stop The Global Corporate Coup! Sign this petition to USTR!!!! Stop The TPP: Tell USTR 'No To This Bad Deal! 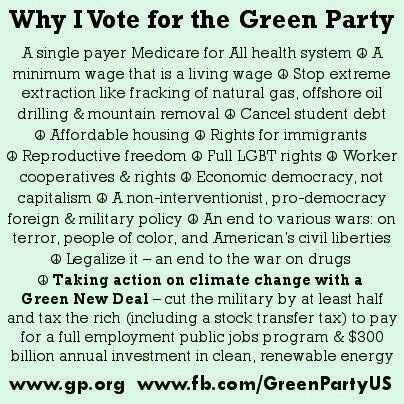 The Green Party takes NO corporate money. A Party Of, By, and For the People! Now is the time to build a bridge from the world we have to the better world we know is possible!